In past years, my good friend D. and I had similar heating systems: oil boilers and old-fashioned cast-iron steam radiators. As of last autumn, though, J. & I had just bought a new old house with no heating system at all, and D. had just ripped his heating system out– leaving us in the same boat of starting more or less from scratch, heating-wise. 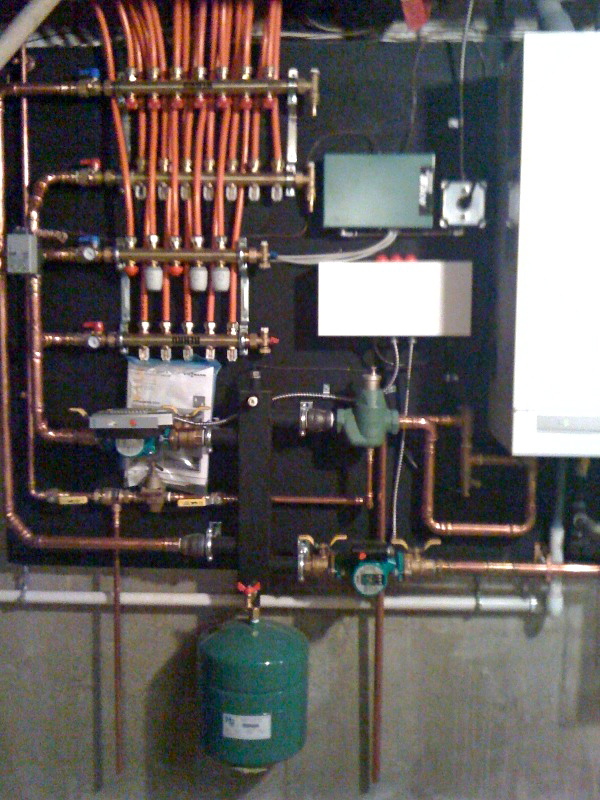 D. wound up installing a Viessmann condensing natural gas furnace driving a system of hydronic radiators. The Cold House wound up with a Jøtul wood stove. We’re both very happy. The burner (far right) actually condenses the water vapor in its own exhaust to reclaim that heat; in this way, it has around 90% efficiency (compared to the 80% or so of our old oil burners). Burning natural gas, it emits almost no particulate pollution– basically, just CO2 and liquid water. The burner heats water, and electric pumps circulate the water into the orange plastic tubing, which then delivers it to and from radiators throughout the house. An array of valves and electronic thermostats allows D. to fine-tune three (or maybe four?) “zones”– cellar, first floor, second floor– such that the temperature in different parts of the house can be adjusted independently. It’s a pretty cool system– efficient and flexible. It was very complex to install, but is very simple to operate. I think it cost somewhere in the range of $8-10,000, with some homeowner-labor involved. Our wood stove has about 75% efficiency. It is considerably more efficient, and emits much less smoke, than wood stoves of 20 or 30 years ago– but still, it is less efficient and has higher emissions than D.’s gas burner. On the other hand, it burns a renewable fuel which is grown within 50 miles of the house, rather than a fossil fuel shipped from across the country. The stove has three moving parts: the door, and two manually-operated air vents. (Piper, shown, does not count as a “moving part”, because she rarely moves.) Compared to the dozens of electrical moving parts of D.’s system, I consider ours reassuringly simple, and it works even when the power’s out. On the other hand, nothing happens automatically– adjustments require human attention, and are prone to human error. We occasionally over-estimate on the wood firing, and get the living room warmer than we intended– that’s wasteful, and wouldn’t happen with an electronically-operated hydronic system. Also, the stove obviously has but one “zone”– right where it is. We do have our own, neolithic system of “zone heat”, which involves blocking off the upstairs with a quilt in the doorway. But we don’t have the option of deciding that we like having the bedroom at 58º, and keeping it there every night. We get what we get, more or less. And to the extent that some people might be able to tolerate lower temperatures, if the temperature was at least steady and predictable, the more complex system might be better. In terms of capital investment, the wood stove and chimney cost about $3,200. If we’d put in three stoves, to create a real “zone” system, the total might’ve been about the same as D.’s system. Lastly, there’s the question of aesthetics. Here, truly, I am torn. The mystic in me adores the ever-changing sight of a fire, the glow of coals in the evening, the feel of each unique stick of wood, even the oaky aroma of our wood pile. But the geek in me is in awe of the systemic beauty and elaborate automated function of D.’s heating system. D’s two-year-old son seems to shares this appreciation; each time I visit, he says “Viessmann – downstairs – basement”, and we go down to admire it. This entry was posted on January 28, 2010 at 9:44 am and is filed under Product Endorsements, Uncategorized. You can follow any responses to this entry through the RSS 2.0 feed. You can leave a response, or trackback from your own site. The problem with the condensing furnace (we inherited a newish Laars Endurance from Previous Owners) is that when something goes wrong, it’s impossible to monkey around manually with the workings. It’s replace the expensive high-tech parts or nothing. Indeed. Whereas if something goes wrong with the wood stove, you just get out a hammer and/or duct tape. Irony of ironies, but it’s actually our wood stove that caused all the headache. Previous Owners didn’t use it, but we cleaned the (tall) chimney, re-caulked everything, and started burning wood. But without a fresh air exchange, the stove was sucking cold air like mad from the basement, around the furnace exhaust pipe, which, when the furnace wasn’t running (b/c we were burning wood), was frosting up and getting moisture into the circuitry. Three motors, two fans, and two boards to figure that out. Now we’ve installed a cold air pipe to wood stove, added a flue to the stove pipe, and sealed off the furnace circuitry, and all seems to be working so far, knock on wood. Best part of this, from M.’s point of view: he got to use a wet hole-boring drill to cut through 3 inches of slate. Val– All newer woodstoves are incredibly efficient wood burners, especially compared to the old “smoke dragons.” And don’t forget that there’s a federal tax credit for new wood-burning appliances bought and installed through the end of 2010, 30 percent of the cost up to a max of $1,500 per filer. As an example, I have a somewhat insulated fairly small 150-yr-old farmhouse in VT. I’m happy with an unheated 2nd floor and have blocked off the stairwell so the heat doesn’t go up the stairs, and I’m OK with having the side rooms a bit chilly. I use a grand total of about 2 (full, not face) cords a year to stay a lot warmer than the ColdHouse Journal folks. Around here, a cord (cut, split and delivered) goes for between $170 and $200. I couldn’t even fill my heating oil tank once for that. But you do need to research wood stoves thoroughly before you even think about buying– not just specific models, but in general how they heat and what you can expect from them and how to figure out how much stove you need for where. There is no better place to do that– maybe no other place to do that– than at the Web site Hearth.com. Read the general info on the site, and then go browse the wood-burning forum extensively to get a sense for what the issues are. One word of caution– the single biggest problem first-time wood burners have, or even just first-time users of the new EPA stoves, is having a dry enough wood supply. Suppliers advertise “seasoned” wood, but it isn’t anywhere dry enough for these newer, more efficient stoves. Wood needs to be cut, split and stacked in the open for at least a year. So whether you plan to buy your wood or cut it yourself, you need to get started way ahead of time. An alternative is kiln-dried wood. More expensive, but also more heat per cord (due to less water per cord). I was horrified by the idea of kiln dried wood, picturing the kiln running on fossil fuel– but later I learned that [at least our local people] have kilns that are heated by scrap wood. So, that seems a bit better. Anyway, it’s not the cheapest way to go, but it sure will make your first experience with wood heating a more positive one– and for that it’s worth a lot. That is what makes this country grand. We all have different personalities and views and adapt out lives as we wish. We can admire our difference and learn but still be true to ourselves. I love to water a fire but haven’t had to get up at 2am to start one to stay warm. Now that we’ve bought a farmhouse from 1812 we have a lot to learn and will adjust. There are 3-4 separate chimneys and a 4 zone oil burning furnace. The house was closed down for the last few years and it was colder inside than outside last time we where there. Does anyone have any input on the most efficient wood-stoves? I will be needing about 5 between the house, barns & cottage. Natural gas is not available although the pipeline is nearby. Val, we live in an 1840-ish Maine farmhouse with attached barn. We purchased a Pacific Energy Fusion woodstove, and are very pleased with it. It does not look like a traditional woodstove, more European looking. That appealed to us. It is very economical in its consumption of wood, compared to stoves we had used in the past, which were horrible. It holds a fire overnight always, and this morning, with the thermostat on the furnace set at 55, three sticks of wood brought the temperature downstairs to 69 within 1 hour. Two hours later, those same sticks of wood are burning. I wish we could put a wood cookstove in the kitchen. Alas, when the previous owner remodeled the kitchen, the chimney came down, and countertops and hanging cupboards went up where the “old” cookstove had been. You might visit http://www.hearth.com for LOTS of information. Good luck. Looked up your Fusion stove on the web– it is beautiful! Val– to answer your question earlier about which wood stove is most efficient– you’ll find that most new stoves now come with EPA ratings for efficiency, much as other appliances do. That makes it relatively easy to compare. But the main thing is to get the size right for the space you’re planning to heat (and degree of heat you want to produce there.) Too large a stove impairs efficiency, while too small a stove can’t keep up and becomes a safety hazard if you try to burn it hotter in response. 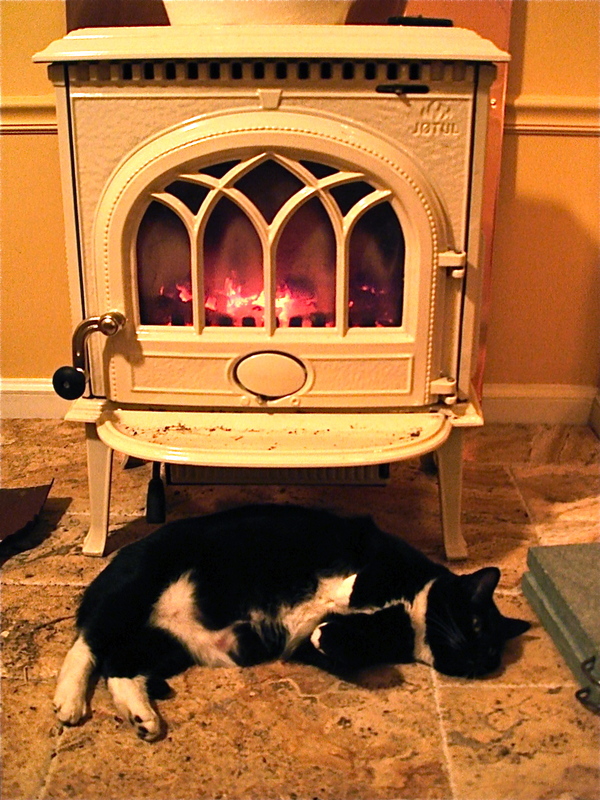 Also, you’ll find that wood stoves now come in two types, catalytic and non-cat; in general the cats are more efficient than non-cats, but have their downsides as well– a lot depends on how you plan to use the stove. Any idea which one will cost less to run–that is, the wood versus the natural gas? We just got a woodstove (not installed yet) and have no idea how to figure out whether it or our oil boiler is actually less expensive to use. We can’t even compare to past winters as we just moved here in July. Yes– without hesitation I can say that we will spend less on heat than my friend D., even with his ultra-efficient gas system. But my absolute certainty on this is based on the differences in how warm we keep our houses, rather than the differences in our heating systems. As an example, suppose the average temperature outside during the heating season is, say, 30º. Suppose two guys have identical heating systems, but one guy keeps his house at 68º, and another guy averages 55º. Very roughly, the amount of fuel they’ll use will be directly proportional to the difference they try to maintain between indoor & outdoor temps. The indoor/outdoor differential for Guy #1 is 68-30=38º; for Guy #2, it’s 55-30=25º. This means that Guy #2 will be using ((38-25)/38) = 34% less fuel than Guy #1. If Guy #1 wants to reduce his fuel consumption by 34% to match Guy #2’s, but doesn’t want to change his habits, he’ll need to buy a new heating system that is 51% more efficient! That will be probably not even be possible, unless they’re currently heating with lumps of dung burning in open 55 gallon barrels. Heating with wood will cost you considerably less than with gas under almost any circumstances. The only exception I can think of is if you have an old, wildly inefficient stove and have to buy your firewood in an urban/suburban area where the few suppliers can soak the customers for very high prices. As above, I heat my small house in VT comfortably with about 2 cords of wood a year and pay an average of $200 per cord. I’m late in on your blog/conversion. I will be getting a new heating system, too, soon. Here wood is expensive, but wood pellets are more reasonable. What do you think about them? Thanks!